For someone who enjoys eating steak, I rarely indulge in doing so. 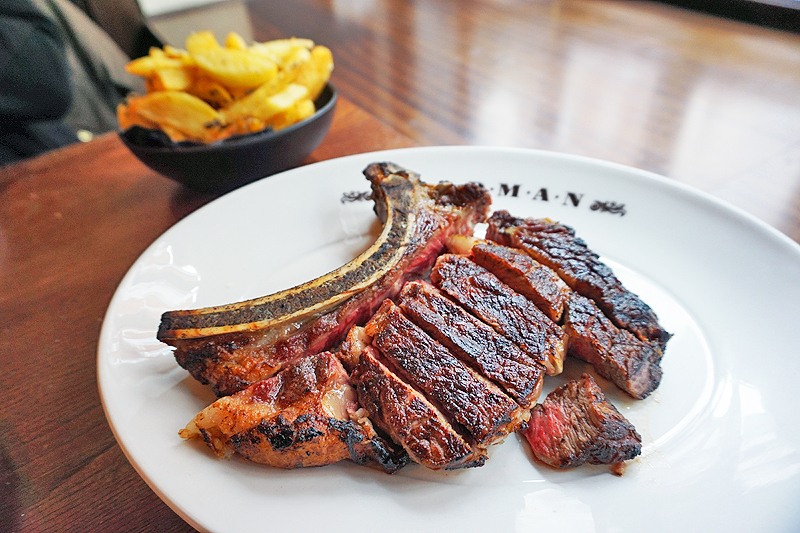 The only steak houses/restaurants in London that I've been to prior to my visit to Goodman were Hawksmoor and Le Relais de Venise L'Entrecôte (I liked the former but not the latter). I think this is because I have to be in the mood or have a craving to eat steak. A few days ago, I had a hankering for steak and, spurred by recommendations from various family members, reserved a table at Goodman. The meal started off with a complimentary bread basket. The white bread and brown bread were soft with a crust that wasn't too hard. The multi-seeded cracker was crispy and the fennel seeds in it added a nice depth. But let's talk about the butter: it was rich, creamy and the right amount of salty. It really elevated the bread and cracker. 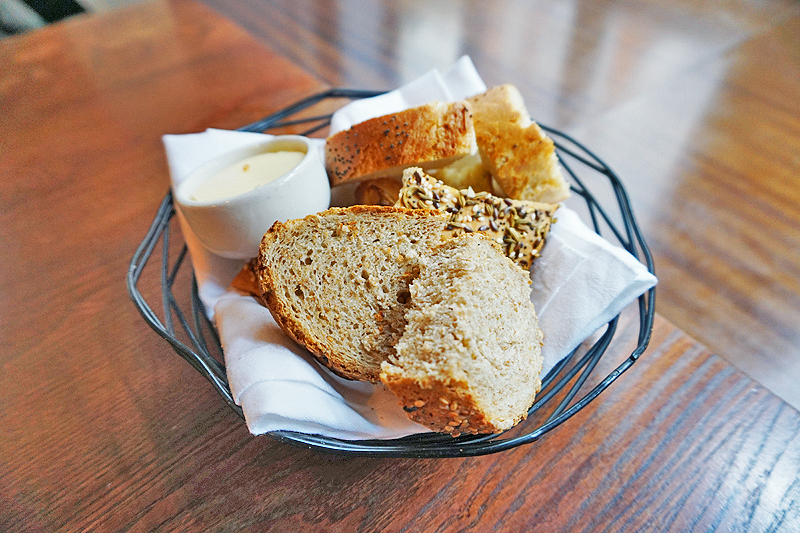 It was so good that we wiped the bread basket clean (I didn't choose the carbs life, it chose me). 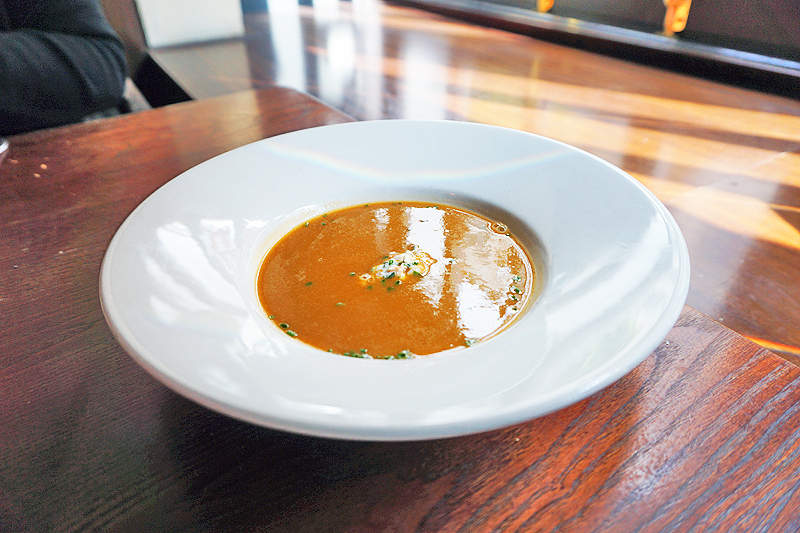 The lobster bisque was smooth, rich and creamy. Oddly enough, it tasted like there was some heat in it, which reminded me of curry. That's not a bad thing per se, but it threw me off because I'm not used to lobster bisque tasting like that. In my opinion, Smack Lobster's version is still the one to be beat. Goodman has different cuts everyday. We went for the Belted Galloway which is grass-fed cattle from the Lake District. When you order cuts with the bones still attached, you lose about 150-200g from whatever size you order. For our 700g, we got at least 500g of meat. The steak was perfectly cooked to our requested medium with the exterior seared, and the middle interior still tender and pink. Ribeye cuts usually have plenty of fat marbling and the one at Goodman was no exception; it literally melted in our mouths. Out of the three sauce options (Bernaise, Pepper and Stilton), we chose Bernaise. The Bernaise sauce tasted quite sour, which I wasn't really a fan of. Fortunately, the steak still tasted great without the sauce. 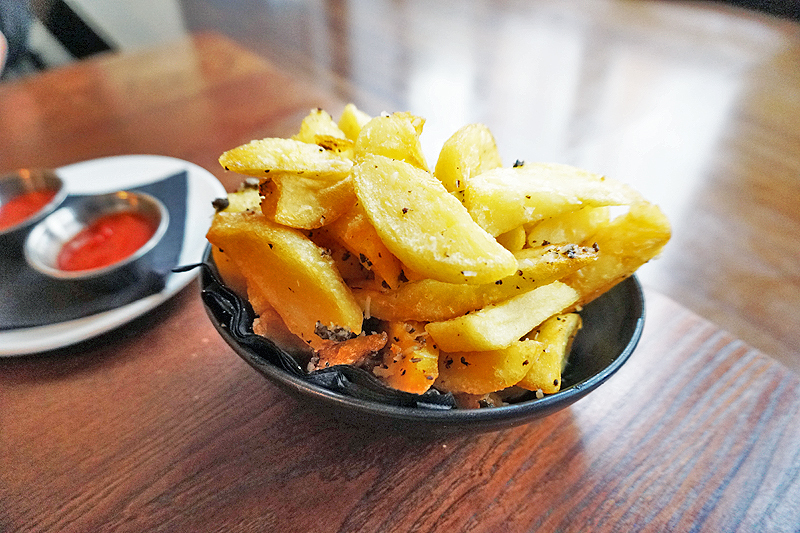 These were the best truffle chips I've tasted in London thus far. They were crispy on the outside and soft potato goodness on the inside. And the truffle! The taste and smell were so strong (insert heart eyes emoji here). The portion was pretty generous and I easily polished off three quarters of it (what did I tell you about the carbs life choosing me?). If you go to Goodman, please do yourself a favour and order the truffle chips. You won't regret it! The spinach was so tasty. How could it not after being mixed with cream and gruyere cheese? 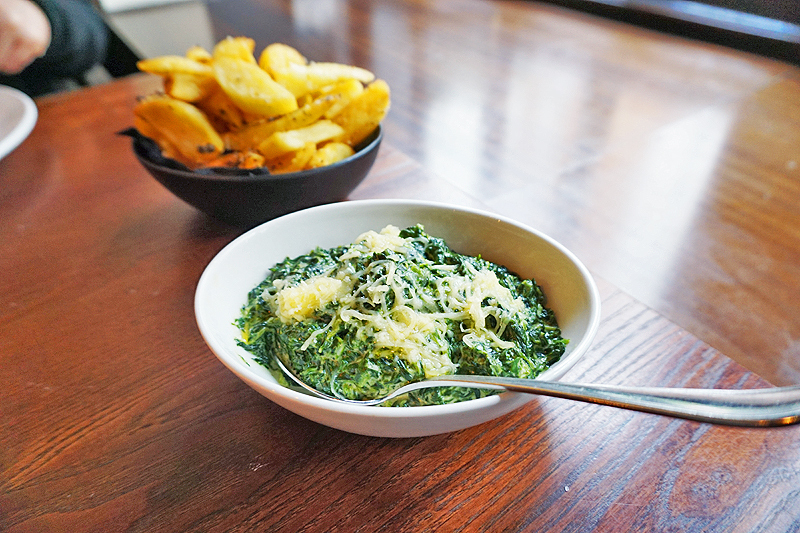 It was such a decadent way of eating spinach. By this point, we were absolutely stuffed but, always having room for dessert, ordered the cheesecake to share. It was rich, creamy and had a decently cheesy flavour, but I thought the consistency was too thick and dense. The tartness from the strawberry and basil salad, which was essentially strawberry compote as we couldn't taste the basil, helped alleviate the richness of the cheesecake somewhat. Perhaps it wasn't the best option to end an already heavy meal. 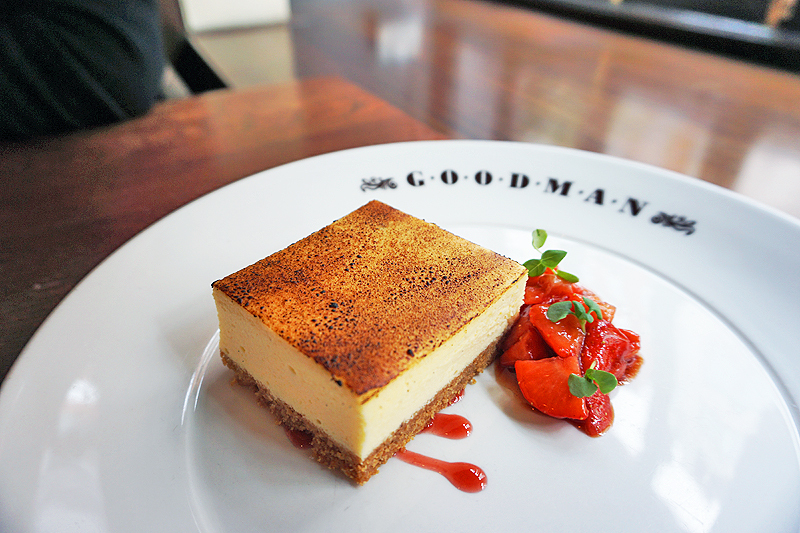 Overall, I enjoyed my dining experience at Goodman. The service was friendly and our server took the time to explain the various cuts available. The place had a laidback atmosphere which allowed us to sit back and slowly savour our meal. We were there for more than two hours, but didn't feel rushed at all.